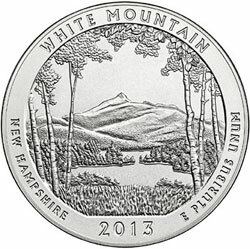 During the period covered by the latest sales report for United States Mint numismatic products, the 2013-P White Mountain National Park Five Ounce Silver Uncirculated Coin sold out. Meanwhile sales moved higher for Proof Gold Eagle and Platinum Eagle coins. The US Mint began sales of the White Mountain Five Ounce Silver Uncirculated Coins on May 16, 2013. Initially, the coins were priced at $179.95, which was later reduced to $154.95. The maximum mintage for the issue was announced as 25,000 units. Initial sales for the coin were strong, exceeding the opening sales figure for the prior release of the series by more than 30%. The sell out notification was posted on the US Mint’s website on October 9, meaning that the coins had only been available for sale for less than five months. The cumulative sales figure for the release per this week’s report is 20,523 units, which is well below the stated maximum mintage level. Last year, the US Mint did not produce these coins to the full extent of their maximum mintages and several early sell outs occurred. Based on the sell out of the White Mountain design, collectors may be in store for a similar situation this year. After spending a few weeks at lower sales levels, the Proof Platinum and Gold Eagle coins saw their sales move higher. The 2013 Proof Platinum Eagle recorded weekly sales of 80 units, bringing cumulative sales to 4,288 units. The weekly sales were more than triple the previous period and the highest figure in three weeks. The 2013 Proof Gold Eagles saw higher weekly sales across all five product options. Sales were led by the individual one-tenth ounce and one ounce coins. The four coin set recorded weekly sales of 50 units, more than double the amount from the previous week. The 2013-W Uncirculated Silver Eagle recorded its lowest weekly sales total in several months at 909 units. The US Mint recently posted the preliminary product page for the 2013 Annual Uncirculated Dollar Coin Set which contains the 2013-W Unc Silver Eagle along with five uncirculated $1 coins. The price for the set to be released on November 14 is only $1 more than the current price of the individual uncirculated Silver Eagle. Why did the 5oz White Mtn sell out when the mintage limit was 25,000? The US Mint did not strike the coins to the extent of the full maximum mintage and apparently decided not to strike more coins prior to the end of the year. Any significance to the El Yunque 3 coin set selling out? I find that a bit surprising, the only set in the series now unavailable from the mint. That El Yunque 3-coin set is commanding a hefty premium on the secondary market now, usually selling for about $30+ over it’s $9.95 issue price. The sales number of just under 20,000 could be indicative of the production level for all five 2012 sets, so keep an eye on the Hawai’i Volcanoes one. It will likely be the next to sell out and could bring a similar premium when it does. Another good item is the 2012 ATB Quarters Circulating Coin Set. It’s been bringing a big premium over it’s original $5.95 issue price, and it rarely shows up for sale. A set sold on eBay for $48 on September 19. There is finally another set for sale right now almost a month later, with a bid of $45. Maybe a lot of those sets were sold to people who intended to keep them, explaining why the supply offered on the secondary market is so slim. Even though it’s only $2.50 worth of clad quarters that could be had much cheaper elsewhere, the packaging is key. So now here come the 1st spouses…5 of them all rolled out in the last 6 weeks of the year, one week between each one. All those ATB quarter sets that are commanding big premiums now will eventually fall back to the value of the coins themselves. Remember the Prestige Proof Sets? Buy the coin, not the packaging.